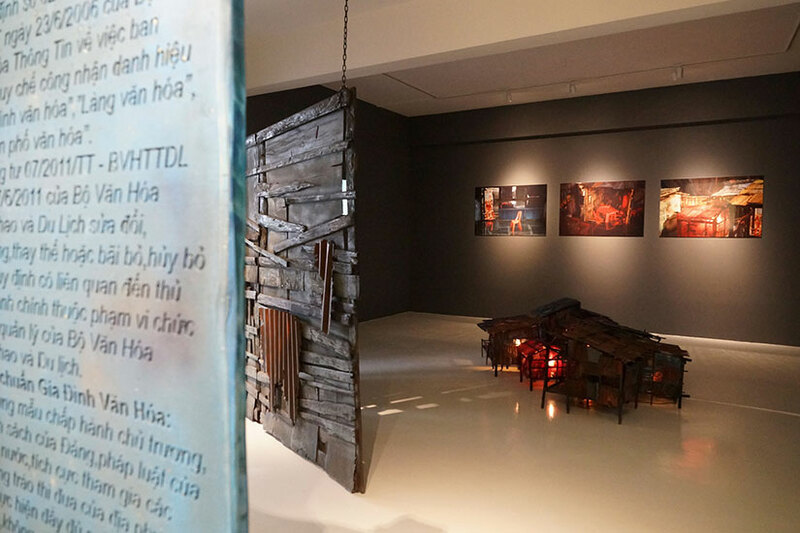 Saigon-based multi-media practitioner Bui Cong Khanh (b.1972) looks at Vietnamese society of the last decade via its image ant text-based culture. Through his work he explores new but quickly-embraced consumer habits, Communist Party propaganda, and rural society’s fast- paced transformation. 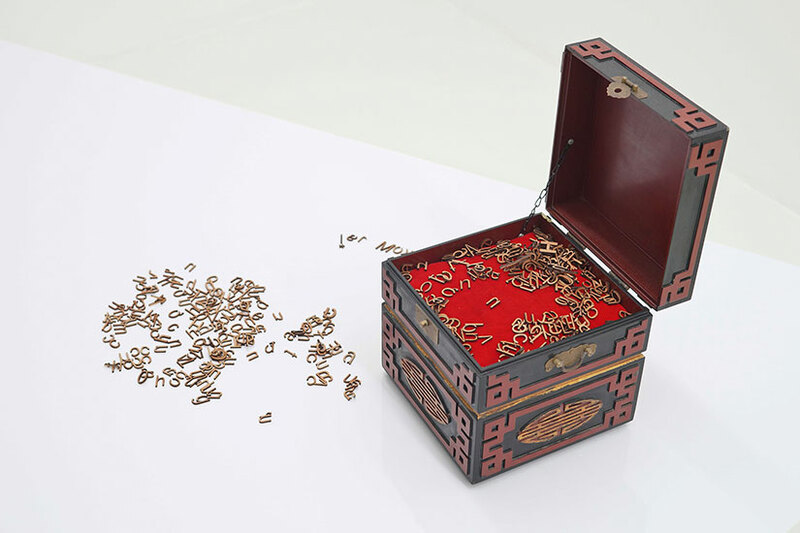 Khanh’s pieces, whether performative, graphic, or installation-based, are thoughtful and if subtly critical of the Vietnamese status quo, consistently engage audiences through their humour and strong aesthetics. Often producing art that references ancient regional cultural tradition in its material or media –porcelain, village theatre, performance, song-, Bui Cong Khanh uses universally accessible visual and formal languages to comment contradictory social, political and cultural tensions cleaving today’s Vietnam. 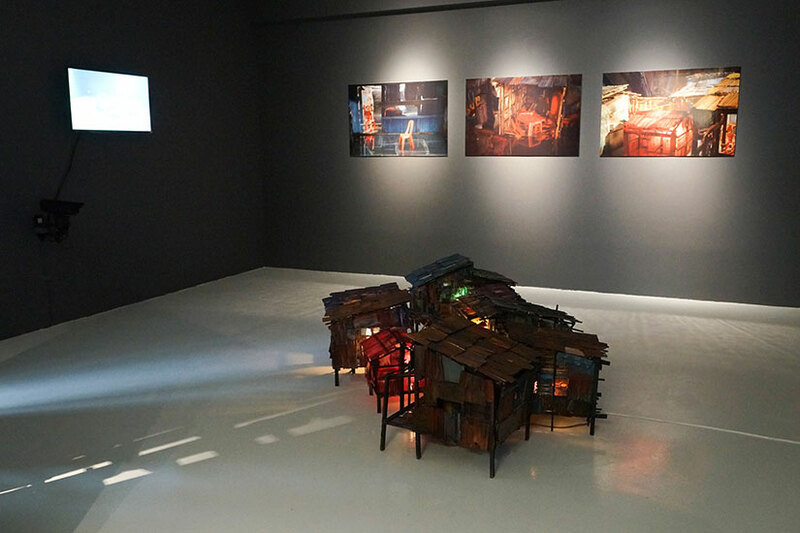 Familiar in Singapore for his compelling interactive photography-studio installation The Past Moved (shown at Esplanade in 2010, and at Singapore Art Museum in 2011), for Yavuz Fine Art Khanh has conceptualised two new cross-disciplinary installation works Saigon Slum and For Home and Country. Saigon Slum, beautiful in execution, conceptual, and socially engaged, is a composite work including installation, video, and photography. 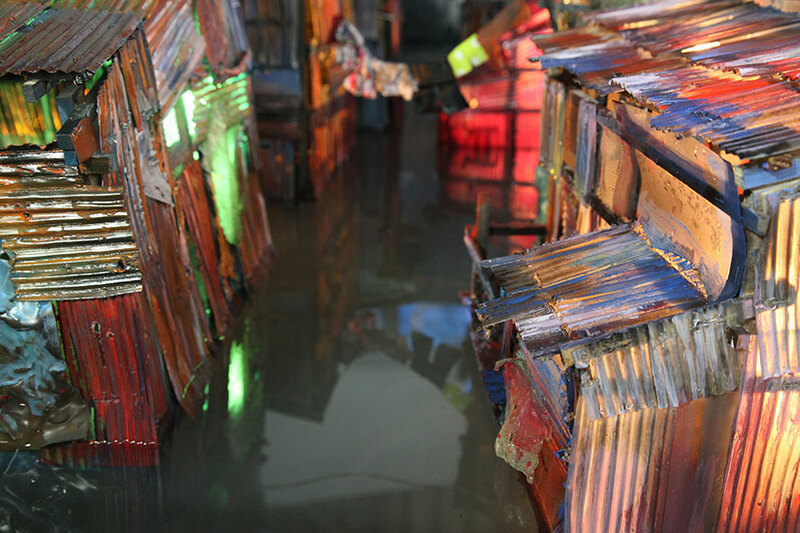 The work’s installation part component is a doll- house-style miniature reconstruction of urban shanty dwellings. The area houses marginals who have refused or are unable to join Vietnam’s race toward prosperity. Intricately-made by hand, the refined craftsmanship of the work deliberately contradicts the shabbiness of the depicted slum. In this way, the artist draws the audience into a critical discourse regarding assembly and exclusion within rigid social structures, as well as the dual promise and threat of state- sponsored egalitarianism. 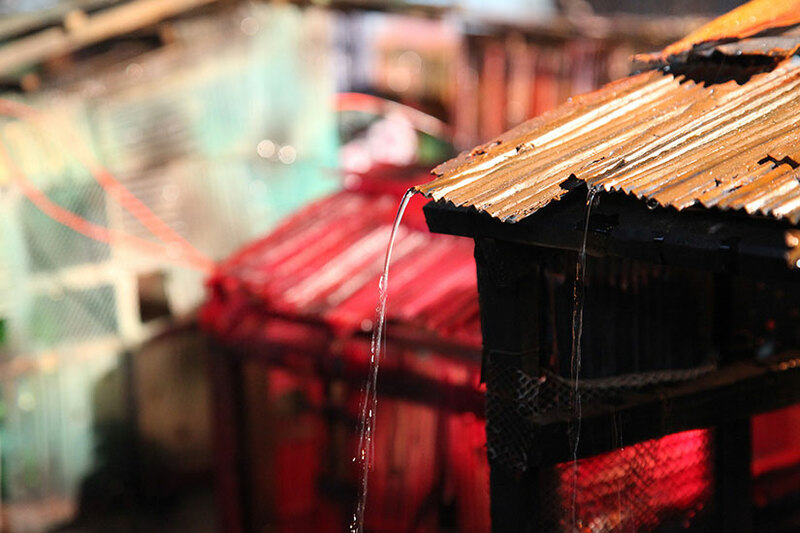 The photographic series of Saigon Slum depicts the miniature slum. Shot at close-range in vibrant colour, the images have a polished aesthetic that is at odds with the grittiness of their subject. Here too Bui Cong Khanh is using medium to deliver concept, the artist engineered a disconnect between the prints, that appear to be of a real shantytown, and the maquette they document, a miniaturised piece of art. 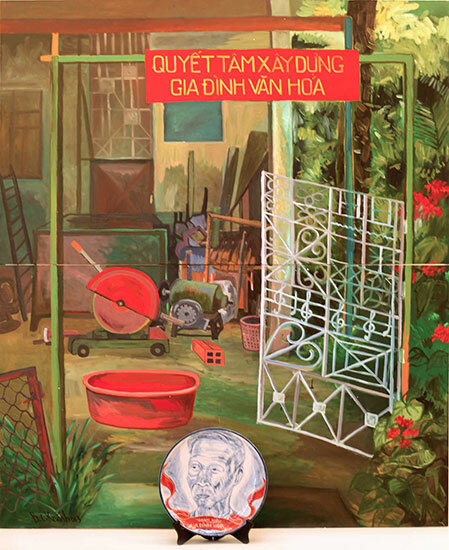 This surreal dialogue between reality and fiction underlines the tension residing at the heart of Vietnamese contemporary society. 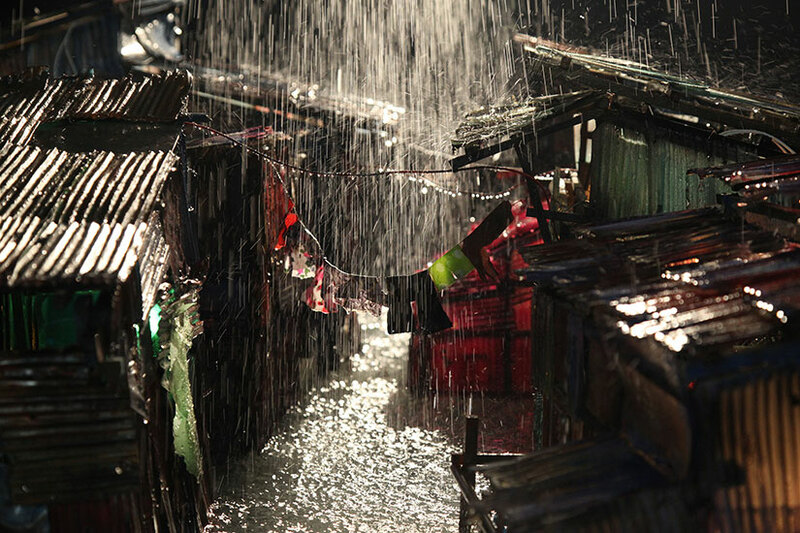 The video, like the photographs, shows the dwellings flooded as slums often are all over Southeast Asia during monsoon season. 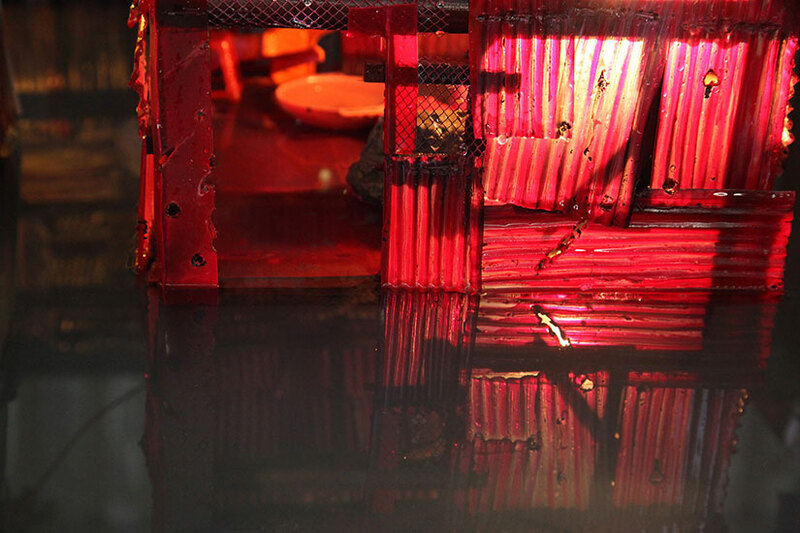 Conjugating a post-apocalyptic atmosphere, intimacy with audience, and the perversely photogenic beauty of the little houses under water, the artist creates a visually engaging and accessible short film that speaks of the startling paradoxes of urbanizing and consuming Vietnam. 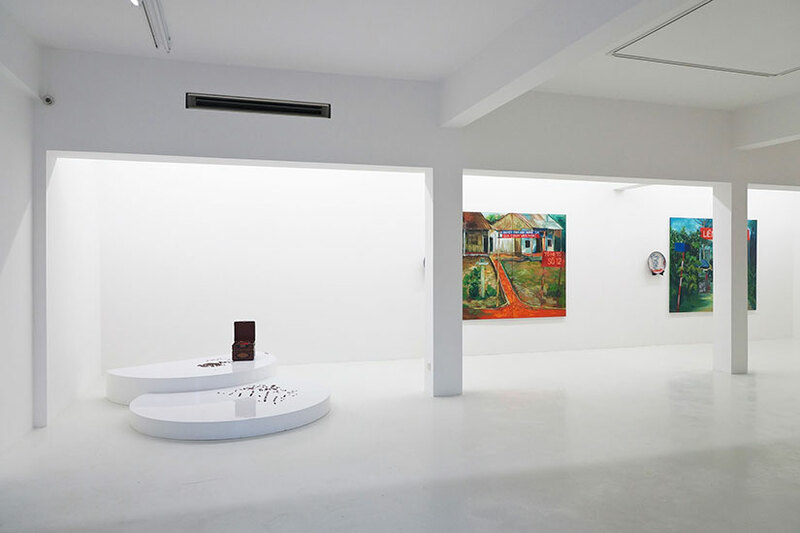 For Home and Country brings together large-scale canvases and ceramics. 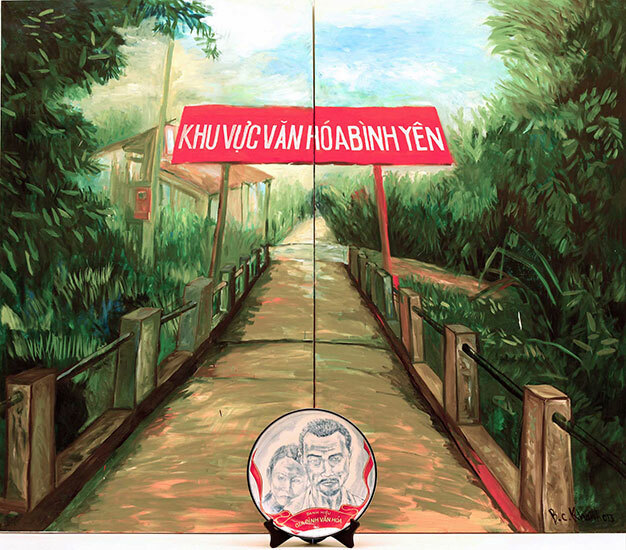 Bui Cong Khanh, whose elegant ceramics are in several institutional collections including the Queensland Art Gallery, Brisbane, here couples painted porcelain plates with the examination of the continuing infiltration of Communist Party slogans in all spheres of life. 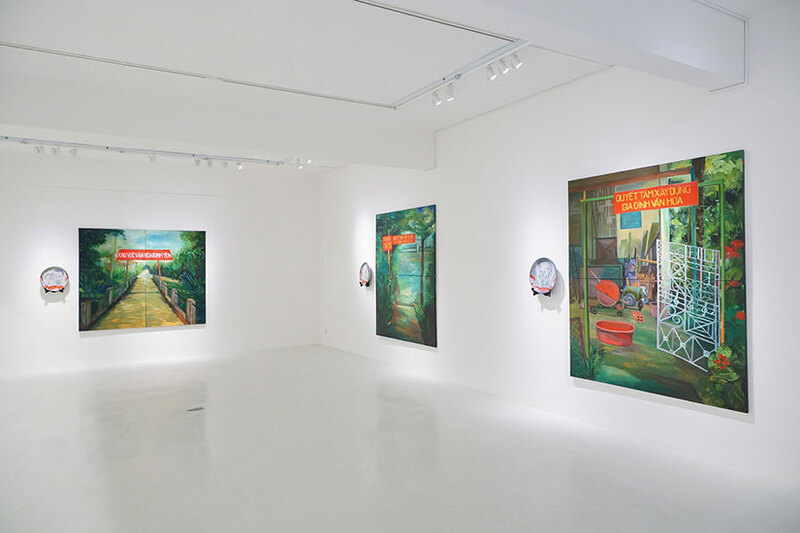 The six paintings, worked in thick oil impasto, evoke the lush tropical landscape of South Vietnamese villages. But no village house is complete without a mandatory propaganda banner festooning its entrance-way. 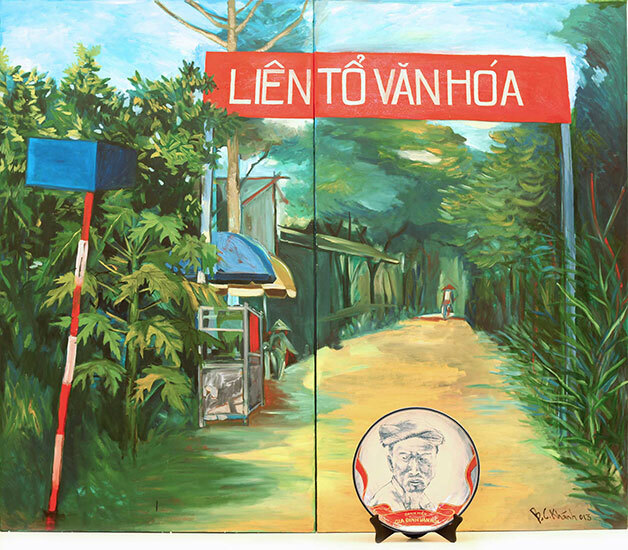 In their confrontation of traditional rural habitats and trite leftist moralizing, Khanh’s oils are playfully provocative. Giving further weight to the paintings’ critical sub-text, the artist has produced a porcelain plate paired with each image. The plates, each one a single-edition, hand-painted, and fired in the ancient imperial kilns at Bat Trang near Hanoi, feature a portrait of the family living in the house. A beautiful object in itself, the portrait-plate here appropriates the kitsch commemorative style of mass-marketed events and personalities. Borrowing vulgar celebrity fascination as common in Asia these days as in the West, the artist through these plates mimics an increasingly-global memorabilia culture that indistinctly celebrates British royals, Ho Chi Minh, and Lady Gaga. 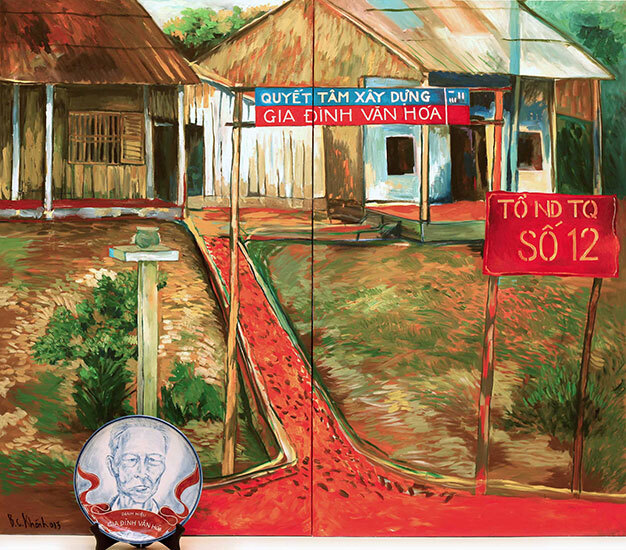 In so doing, Bui Cong Khanh travels beyond the Vietnamese context, highlighting the dangerously comfortable fit between unchallenged propaganda, and mass culture. 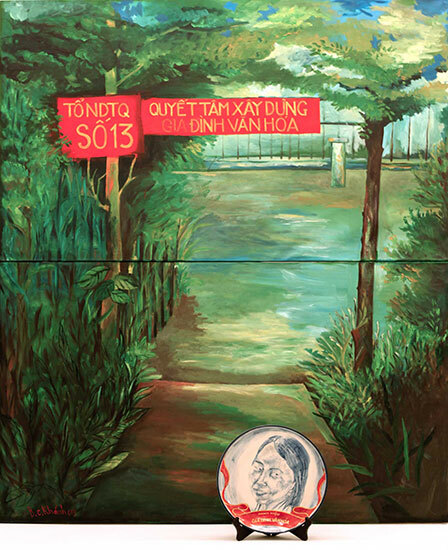 Visually seductive, technically accomplished, and offering multiple conceptual readings, Saigon Slum and For Home and Country reveal Bui Cong Khanh as one of the most sophisticated and socially cogent artists working in Vietnam today. For Home and Country is curated by Singapore-based Southeast Asian art specialist Iola Lenzi, guest curator of the acclaimed Singapore Art Museum exhibition Home History and Nation: two decades of contemporary art in Southeast Asia 1991-2011.